Decent breeze and bright sunshine for the last race of the season and all to play for in the series. Good start in some clear air but soon realised that the No. 3 was not the right headsail so had to change up to the No.1. First mark was Royal Thames and chose to go to the South of the Bramble Bank where there should have been less tide but it did not seem to pay off and ended up towards the back of the fleet rounding the mark. Good downwind leg and pulled away from Whistler and Pastime of Hamble. On the second beat to Royal Thames had to deal with a container ship but did not loose out too much. Long downwind leg to the finish and managed to pull some distance on Restless. 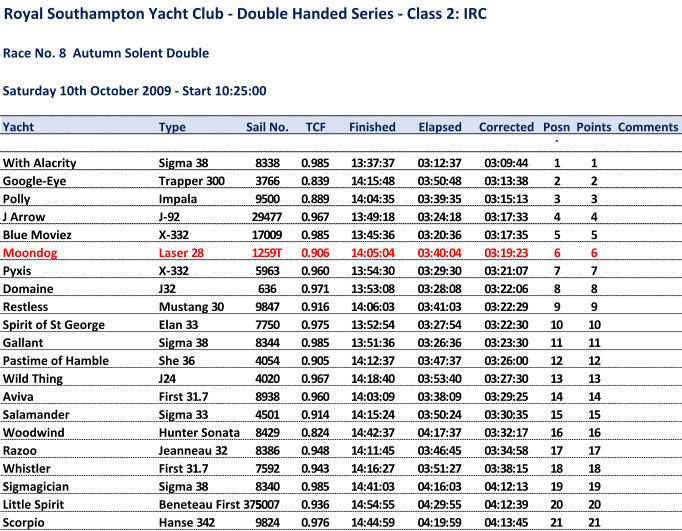 Had enough time on Pastime of Hamble but not sure how we had done overall as we had not seen Spirit of St George, however, they turned out behind us on corrected so our sixth place was good enough to win the overall series.